A scene from “Disgraced” at the San Diego Rep. If you relish theater that delivers a gut-punch, brace yourself for “Disgraced.” Not once, or even twice, does the audience audibly gasp. There are a number of shocking moments you won’t soon forget. You’ll also very likely leave the theater profoundly disturbed and unnerved. This two-couple dinner-party setup makes “God of Carnage” and “Who’s Afraid of Virginia Woolf?” look like child’s play. The stakes are much higher here: in sweeping strokes and pinpoint attacks, racial, cultural and religious groups are being exposed and undermined. Perhaps the structure of the piece, and its characters, are a bit symmetrical and contrived. In the two couples – all highly successful New Yorkers – there’s a white woman married to a Pakistani-American, and a Jewish man with an African American wife. Midway through the fennel salad, the conversation takes an inflammatory turn, from assimilation to race-baiting. Which group has been more oppressed? Which has been more frequently racially profiled? Which has had to tamp down more of their true nature or cultural indoctrination to be a functional, successful, accepted part of the American mainstream? 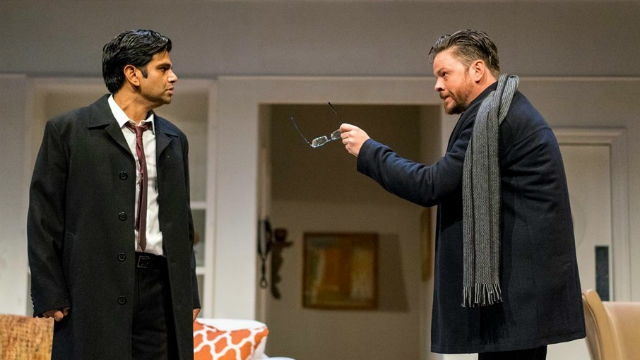 Ayad Akhtar’s drama (his first play) won the 2013 Pulitzer Prize, and it’s currently the most produced play not only in the U.S., but around the world. It chronicles the rise and fall of Amir Kapoor, who changed his name (from Abdullah) and his “social,” tacitly accepting when people assume he’s from India. A prominent, recurring theme here is minority status, cultural expectation and who you are vs. what you seem to be. Amir, who was brought up in a traditional (and decidedly anti-Semitic) family, is a self-described “apostate,” who’s rejected Islam and the Qu’ran. But as he gets drunker and angrier, as everything he’s built up for himself starts to slip away, he begins to look more and more dangerous, perhaps even neo-terroristic, like his nephew Abe (who changed his name from Hussein). Amir’s wife, Emily, an artist who adores (and appropriates) Islamic art, is angling to get into Isaac’s latest show at the Whitney. But as the evening devolves, she’s forced to take a hard-edged look at her life choices, and the religion and culture she so vociferously defends. Once the interchanges get really heated, Isaac, the pedantic art dealer, baits Amir and is appalled at the response. Jory, an African American attorney in the corporate law firm where Amir has been rising, keeps her head down and lives by the words of Henry Kissinger. There may be one too many plot twists, but the tension remains high (buffered by a laugh or two) throughout the fierce, intermissionless 90 minutes. Like a classic tragic character, Amir brings about his own destruction. But it’s important to put him and his acts in perspective; he and his nephew are no more a representation of all Muslims than the Macbeths are model Scots. Some have said the play fuels Islamophobic fears. And they may have a point. But the piece is discomfiting on so many levels that you have to just let it seep into you and settle. You should definitely follow your viewing with some deep, probing conversation (the San Diego Rep is providing a number of such opportunities). You may need some guidance in processing your feelings after this one. The Rep production is beautiful to behold (stunning scenic design by John Iacovelli, beautifully lit by Brian Gale): a dazzling, upscale, Upper East Side apartment, with a balcony — and realistic traffic noise when the sliding door is open (sound by Kevin Anthenill). Exquisite multi-cultural objects abound on the shelves. After the emotional explosion and meltdown, the set transforms with lightning speed (kudos to the stagehands! ); it’s stripped bare for the final scene – Amir is left alone, his raw, fulminating resentment and rage having done him in. Ronobir Lahiri’s Amir parades the arrogant self-satisfaction of a man who wears $600 shirts but who, when humiliated and degraded, lashes out in atavistic, animal fury. It’s a potent performance. Allison Spratt Pearce, looking radiant, is most often seen locally in musicals. Here, she displays her formidable dramatic chops, in a natural and nicely nuanced characterization of misguided Emily. Richard Baird is effective in suppressed professorial mode as the smug provocateur, Isaac. K. Keala Milles Jr. brings an impetuous fervor to young Abe (also misguided, but in different ways). Jory is the least defined character, and on opening night, the role didn’t yet seem a comfortable fit for Monique Gaffney. Director Michael Arabian (last in San Diego in 2014, a stellar production of “Red” at the Rep), maintains a crackling, highly-charged mood, but he plays the extended pauses to excellent effect (the audience needs time to catch its collective breath). Akhtar has continued to explore the Muslim-American experience (in his award-winning novel, “American Dervish,” and his play, “The Who and the What,” which premiered at the La Jolla Playhouse in 2014). With his sharp, piercing mind, he can be poetic or incendiary. There’s much more of the latter here than the former. Performances are Wednesday at 7 p.m., Thursday-Saturday at 8 p.m., Sunday at 2 p.m. and 7 p.m.